What Is Prealloyed Powder Metal?. In the highly competitive parts production world, engineers and purchasers search for low-cost alternatives that can stand up to the wear and tear of rugged use. The process of metal forming has advanced tremendously in the past few decades. Now powder metal manufacturing is becoming the technology of choice for several industries. The science of powder metallurgy is unique in that you can either blend a new powder into the basic iron powder, or add it earlier during the melting process. This is called prealloying. You can leverage prealloyed materials to cost-effectively enhance part performance in terms of strength, magnetic qualities, wear resistance, hardness, and more. Let’s learn more about these advanced materials. What Materials Are Suitable for Prealloyed Powder? We'll be looking primarily at admixing and prealloying for the purposes of this article. Let’s focus on low alloys first. There are three classes of low alloys that are suitable for this process. One includes molybdenum; another includes molybdenum and nickel. Engineers find that prealloying with molybdenum does not impair the iron powder’s compressibility. The final class is sinter hardening, which involves a higher ratio of both molybdenum and nickel. Chrome steels fit under this category. Certain AISI 300 and 400 series stainless steels, used for the production of sinter powder metallurgy parts, are also available in powder form. When your manufacturer makes a prealloyed material, each powder particle maintains the unique alloy composition of that specific particle. So if your metal powder mix has 1% molybdenum, every single particle in that mix should have 1% molybdenum. Naturally, the finished component holds that composition, too. As with any metal forming process, there are specific situations where prealloyed powders are appropriate. You can use prealloyed powders to produce a wide variety of quality parts with high levels of strength and hardness. And they come with virtually all the advantages all powder metals parts possess, like great magnetic properties and net-shaping capability. Another factor: You may know that proper manufacturing processes can reduce porosity to as low as 3-5%, while maintaining shape dimensional control. Some prealloying elements are great for strength and heat treatability, but they might diminish the ability to compact to higher density. Certain alloys reduce compressibility, whereas others do not -- keep this in mind when designing. Copper prealloying, in particular, is not worthwhile for compression purposes. When your vendor prealloys it, issues arise that can affect performance. But, if you have it added as a powder, there’s minimal negative effect on compactibility. Powdered metallurgy is a low-cost technology that can be used to improve product effectiveness, in no small part because so many material options exist. You can make a product lighter or smaller, extend battery life, or reduce costs on high-volume parts. The secret to determining when it’s appropriate to use prealloyed powder metal is to maintain a balance between cost and performance. Does density matter to your design? Do you need copper for its conductivity? Work with a powder metal expert who can recommend the best approach to cutting costs while optimizing part performance. Prealloyed Powder -- What’s the Point? What are advanced powder metallurgy manufacturers trying to solve with this material? For innovative powder metal companies, part of improving your product is using prealloying to effectively melt everything together and, during sintering, allowing things to homogenize. 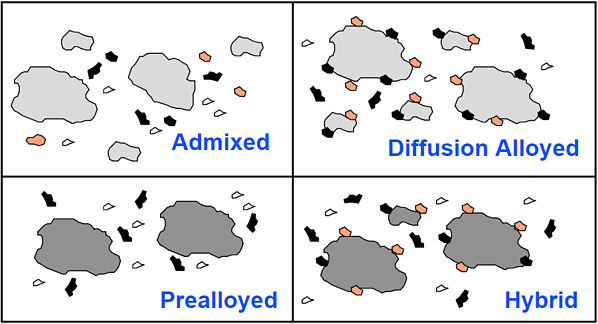 So prealloying can actually be obtained by melting, or advanced sintering processes. Only a handful of advanced powder metallurgy companies specialize in this, so ask in advance whether it’s possible. The advantage of designing with materials this way? Again, you shouldn’t melt certain materials due to loss of compactibility. But if you use those same materials as a secondary adition, you retain that all-important density. This, and the ability to alloy elements that can’t be melted, allows you to develop unique material systems. Want to learn more? Ask a powder metallurgy expert!